The positive factors of remaining physically active are extensive and apply to everyone, young and old alike. Very often when we hear professionals make suggestions for people to become more physically active, we incorrectly think that they are encouraging us to become athletes, runners, or body builders. We may also erroneously think that we need to hire a personal trainer, join a gym, or sign up for a 5K. Instead, what experts are motivating people to do is really quite simple – get your body in action and keep it moving as much as you can. This applies to seniors and exercise just as much as it is to their younger counterparts. 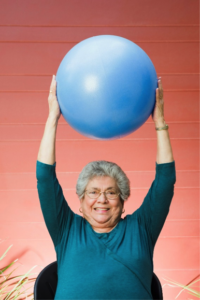 As a matter of fact, seniors may even benefit more than younger adults from staying active. Seniors are unable to exercise. It’s unwise and dangerous for the elderly to begin an exercise program. Seniors gain few benefits from exercise. It is too challenging to set up exercise programs for older adults. Help prevent or delay some diseases and disabilities, and in some cases, actually improve some conditions. Increase stamina and improve the health of the heart, lungs and circulatory system. Help prevent a significant cause of disability in older adults through balance exercise: falling. Give seniors the strength to maintain independence and avoid injury by doing resistance training exercise just once a week. Cause reversal of the brain shrinkage that occurs as people age. “Movement is what keeps us alive,” said 90-year-old personal trainer Moe Carson when he appeared on the Rachel Ray show. Moe also states it doesn’t matter when you begin – just start. Exercise is crucial for everyone at every age. View the video here. At Hired Hands Homecare, our at home caregivers in Novato and the surrounding areas are skilled in discovering safe ways to promote seniors and exercise regimens to keep older adults active and thriving. To learn more about our California home care services, please contact us today.